The value of yoga to a woman on the infertility journey may seem evident. Yoga provides deep relaxation, improves well-being, and offers the much-needed opportunity to release the anxiety of the mind and connect with the wisdom of the body. What you may not know is that in addition to these essential benefits, the ancient practice of Kundalini yoga and meditation can work directly with the hormonal and reproductive systems to optimize their function and increase the probability of conception. Kundalini yoga is so transformative, in fact, that after nearly ten years of helping women heal their reproductive health, I’m convinced it is the shortest path to restoring fertility. Mind-body research has shown that tension, anxiety, and other emotional disturbances interfere with vital secretions of the pituitary gland, the master endocrine gland that affects all the body’s hormonal functions. When a woman is under stress—and you probably don’t need to be told how crippling the emotional, mental, and financial stress of infertility can be—ovulation can be delayed or suppressed altogether. Stress also changes the immunologic functioning of the cells in the reproductive tract. Studies have demonstrated that as a woman learns to modulate stress, her fertility can change. 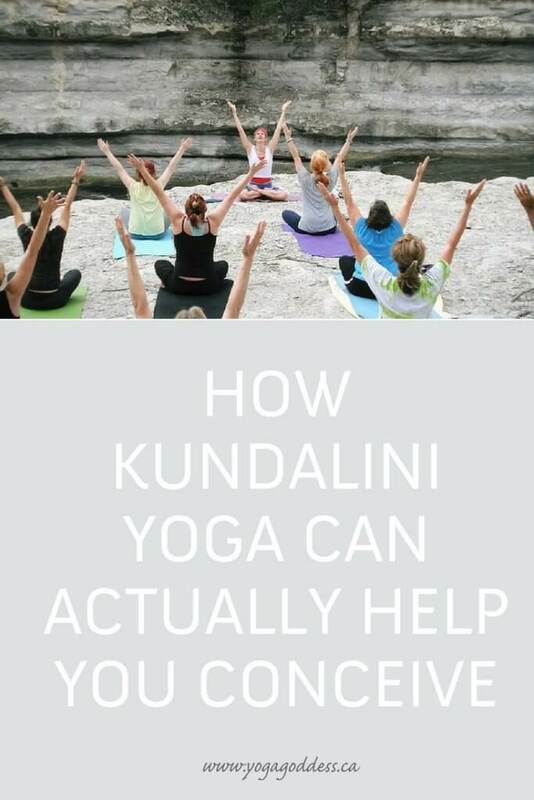 Kundalini yoga and meditation is a powerful means of reducing stress and restoring calm to a woman struggling to conceive, and this alone can be revolutionary. But it also goes further. Kundalini yoga employs prescribed sets of postures (called kriyas) to move energy up from the root chakra of the body through all seven chakras, or energy centers. Because the first three chakras house the reproductive organs of the female body, this flow of energy is crucial to a woman’s fertility. Specific kriyas, along with a meditation practice, also work with the parts of the brain responsible for reproductive health, such as the hypothalamus, the pituitary gland, and the pineal gland. In the Moon Goddess fertility yoga practice I developed, I teach a kriya to optimize the functioning of the pituitary gland. The pituitary is responsible for regulating female reproductive hormones such as LH (luteinizing hormone, which causes ovulation), FSH (follicle stimulating hormone, which matures the eggs in the ovaries), progesterone (which causes the endometrium to mature so that it can support implantation of the fertilized egg), and estrogen. In yoga, the pituitary gland is also understood to regulate a woman’s mental and emotional health, an essential element of her ability to conceive. Alongside these fertility-enhancing yoga postures—and equally vital to healing reproductive challenges—is meditation. The Kundalini meditation practices I share with clients are prescriptive in nature, meaning they’re designed to solve a particular problem. For my fertility clients, I use a breath meditation to restore regular menstrual cycles and harmonize hormonal health. Meditation directly affects the pituitary gland, as well as the hypothalamus and the pineal gland. The hypothalamus is the part of the brain that signals the pituitary gland to release hormones. The pineal is the gland that produces serotonin, which is important for libido and well-being, and melatonin, which is connected with feelings of relaxation and is also thought to be involved in reproductive function. The yoga and meditation work in tandem to reduce stress, improve the flow of energy to the reproductive organs, and stimulate the glands crucial for conceiving and supporting a healthy pregnancy. When combined with the personal guidance of a skilled teacher, I have found Kundalini yoga to be deeply healing. In ten years I have seen a success rate of 50 percent among clients who were previously diagnosed with unexplained infertility. Within this practice lie ancient techniques that can and do help women release the pain of infertility and move beyond it into wholeness as the healthy, vital, fertile women they are. Curious to know more about Moon Goddess? Read all the program details here. I have heard that practicing yoga can help with conception. Thanks for posting this article and providing more detail on this. Now I know how I am spending the rest of my morning – reading your fertility secrets report and researching more about Kundalini Yoga.